I always love when I find a floral photography object that I can beautifully isolate against an attractive background. My last picture of this kind I found on my last visit to the local Wildlife Sanctuary Hall's Pond in Brookline, Massachusetts. Brookline is more famous for being part of the finishing miles of the Boston marathon, birthplace of J.F. Kennedy, 60 minutes reporter Mike Wallace or late night host Conan O'Brien and I also like living here for its close distance to Boston and natural habitats like Hall's Pond. 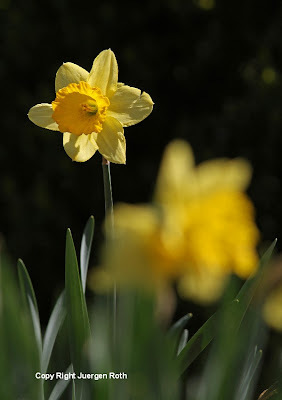 I captured this glorious Daffodil in the formal garden of the wildlife sanctuary. The contrasting yellow and green colors of these spring flowers in front of the dark really stood out and immediately drew me in. The tall floral that I actually made the main subject was brightly lit by the sunlight. I set up my tripod and camera and started composing around the yellow flower with my fixed focus Canon EF 300 mm f/4.0L IS USM lens and Canon EOS D7 camera. 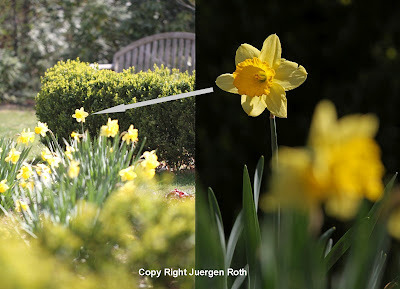 The sunlight made for high contrast between the sunlit daffodil and dark background created by the fast shutter speed. The wind was a little problem but my persistence kept me shooting until I captured my vision. The camera aperture was set to f/8 that resulted in an exposure time of 1/400 sec. and provided the limited Depth of Field to blur out the flowers in the foreground and shrubs in the background nicely. I compensated the underexposed by 2/3 of a step that helped to saturate the colors and make the yellow daffodil spring flower really pop. During the post processing I minimally adjusted lighting, contrast and color saturation before sharpening this floral image.